The process of replacing damaged tooth and its root with dental implants or crown, or embedding implant or crown in place of missing tooth is known as dental implantation and it’s really proving to be very fruitful for people who have missing teeth or their teeth have been damaged by any reason. Dental implant provides an appearance and functions exactly the same as that of a natural tooth and it’s hard to judge if you have gone through a dental implantation process. Dental implant replaces the natural tooth or can be fixed in place of missing tooth without harming the neighbour tooth or gum-line. Whereas, embedding crown in place of missing or damaged tooth requires the adjacent tooth to be grounded to support the bridge. Replacing the damaged tooth with dental implants give better preservation as they are integrated with the jaw bone and hence keep them healthy and strong while in case of using bridge, some of the bones begin to deteriorate. It is easier to clean and care dental implant as compared with bridge. Sometimes the resorbed bone underneath the bridge gives an unattractive appearance which is not in case of implants. The cement with which the bridge is fixed; washed out with a span of time and allows bacteria to home in the voids created which ultimately decay the strength of the tooth root. While if you are using the implant method, you hardly need to worry about the voids and hence bacteria to home there. The very first step of single tooth implantation is to infuse the implant which looks similar to a screw or cylinder and allowed to bond with the bone for a span of two to three months, so that; it may work like a better anchor for the artificial tooth. For that span of time, a temporary tooth replacement is embedded to the site. The second step is to attach an extension to the implant- a temporary healing cap which works like a base for the new tooth. After that, gums are allowed to heal for few weeks. It is noted that this step is necessary. In one stage implantation this step is omitted as in such process, dentists use implants that already have an extension piece attached with them. But the process is adapted according to the case of your dental treatment. The final step is to place the artificial tooth which is called the crown, created in the lab according to your teeth set and attached to a small metal post which is known as “abutment”. It may take some time to get adjusted with neighbour teeth and finally you get back your beautiful smile with a perfect ability to chew and bite your favourite meal with the help of the tooth implant. The steps of the process can either be combined or split in two to three visits as per your dental case and its complexity which will be concluded by your dentist. 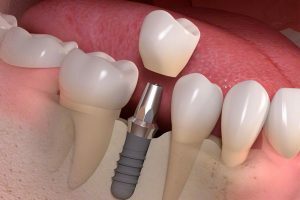 If You are looking to Consult Best Implant Surgeon in Ahmedabad, You Can Contact Dr. Mansi Patel and get 30-50% Discount on Dental Treatment.